In many people’s eyes the one real benefit of winter arriving in Europe is that it brings with it Christmas and the wonderful European tradition of Christmas markets. 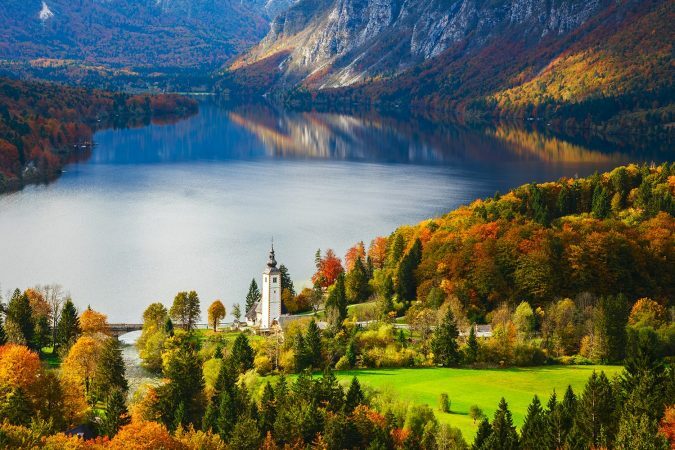 When deciding where to go to enjoy this beloved celebration, I’m sure many would say that there’s no better destination to visit during winter than Germany. 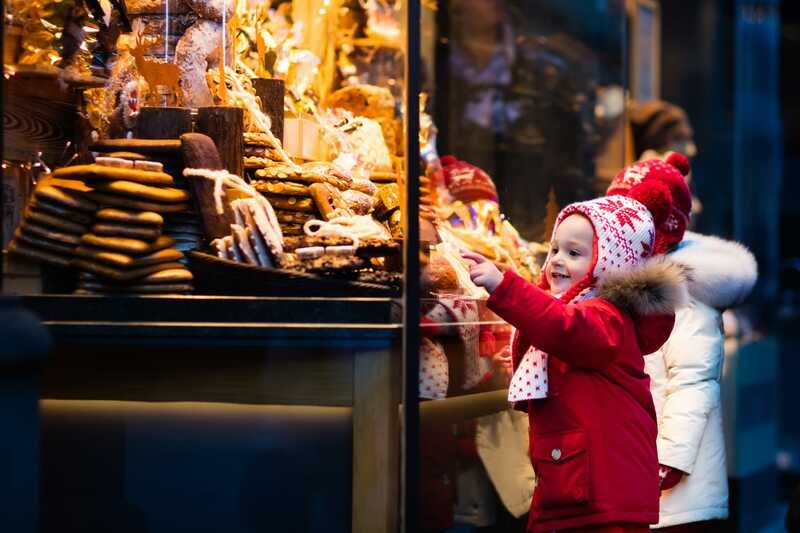 Christmas in Germany is special, packed full of tradition and a true feast for the senses. You have the beautiful lights and the tantalizing smells and tastes of the food, not to mention the music and songs. And if you’re lucky enough to get some snow, the atmosphere becomes truly magical. Germany loves its Christmas markets, and these celebrations practically take over in the lead up to Christmas Day. It’s no surprise that so many other countries try and copy German Christmas markets, they’re so adored. 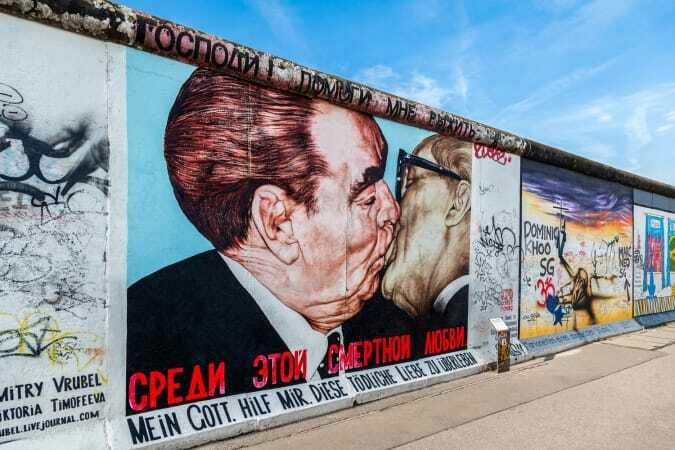 But once you’ve settled on visiting Germany, what then? Germany is a big country and every city, town and village seems to have a Christmas market that you shouldn’t miss. Well, put your mind at ease, as we’ve put together a list of the best Christmas markets in Germany, so you’ll know exactly where to go this winter season. 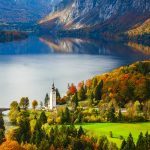 The first destination on this list will be of no surprise to those who have spent any time looking for fun winter destinations in Europe. After all, Nuremberg is often considered to have the best Christmas markets in Germany, let alone Europe. This captivating medieval city in the state of Bavaria is downright magical once its famous Yuletide festivities arrive. A big part of what makes the Nuremberg Christmas markets so special is their overwhelming sense of tradition and history. The city’s markets date back to the 16th century, which means the modern markets echo hundreds of years of local customs and eccentricities. For instance, in Nuremberg the central figure at Christmastime isn’t jolly old Saint Nick but the Nuremberg Christkind. This angelic figure with gold wings and a crown is the traditional giver of presents in this part of Germany. It’s also who the Nuremberg Christkindlemarkt is named after. As for the markets themselves, they are set in Nuremberg’s medieval Old Town, within the main market square Hauptmarkt. It is here that the city’s festivities are concentrated, from the double-storey carousel to the young woman dressed as the Christkind greeting kids in the crowd. 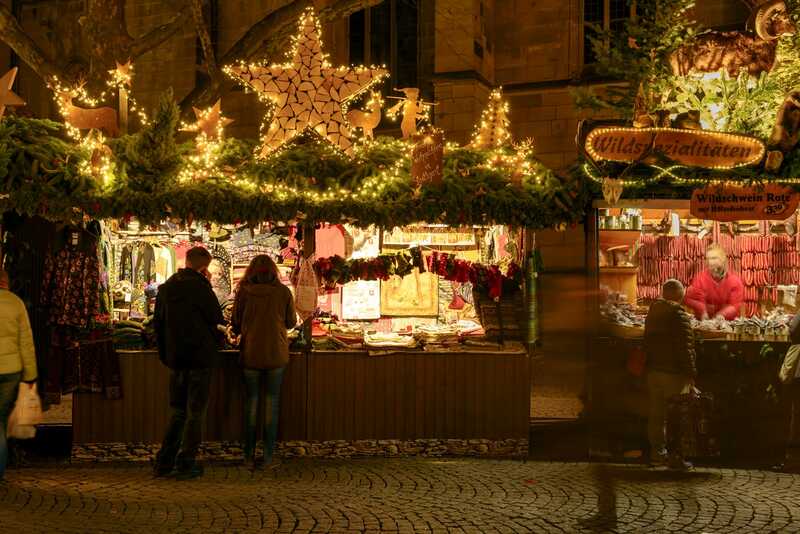 A visit to the Nuremberg Christmas market wouldn’t be complete without taking in all the different stalls and the goods on offer. On the food front you’ll find scrumptious gingerbread and Nuremberg sausages, which are a roll with three small sausages for convenient holding. Of course, this is best washed down with an invigorating mug of warm mulled wine called glühwein in Germany. As for gifts and ornaments, there’s the rauschgoldengel, a small gold foil Christkind figure, and the whimsical prune men, stick figures made from dried prunes. Of Germany’s Christmas destinations, the city of Dresden is a close second, thanks to its long held ties with this season of merrymaking. 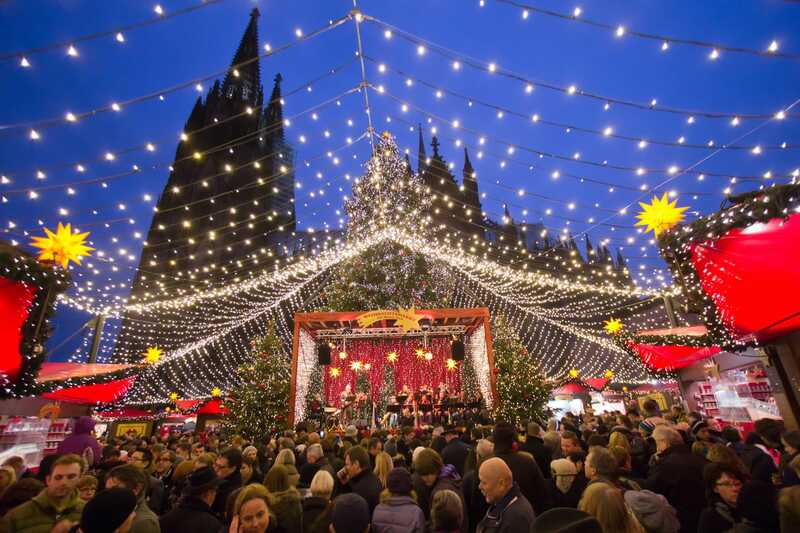 Today it hosts over three million visitors during the festive season, with its Christmas markets being the main draw. The city hosts 11 Christmas markets, but the one to visit above all others is the Dresden Striezelmarkt. After all, this year marks the 584th Dresden Striezelmarkt, making it one of the oldest Christmas markets in Germany. Held on Altmarkt square, the market has a long avenue of Christmas lights leading up to it along Prager Straße and Seestraße. The market has a strong focus on traditional Saxon treats and folk art. Its name comes from a treat once known as striezel, but now beloved as stollen. Dresdner stollen is a Christmas fruit loaf and even has its own festival, Dresden Stollenfest, on the 8th of December. This one-day festival features a pageant and a massive oversized stollen weighing several tonnes, cut up and served for charity fundraising. Other popular items sold at the market include Moravian stars and Lusatian blue damask fabrics. The Striezelmarkt also involves activities to entertain and delight like a puppet theatre and enchanted forest. Other Dresden markets that illuminate and liven up Dresden’s ornate Baroque architecture include the Neustädter Advent across the Elbe and the Mittelalter-Weihnacht im Stallhof, a medieval themed market with minstrels and even a public bathhouse. The size of German Christmas markets tends to reflect the size and layout of their cities. In the case of Berlin, the German capital, this means lots and lots of different markets spread out across this fascinating city. Despite their briefer history (compared to others on this list) and their smaller individual size, Berlin still manages to host some of the best Christmas markets in Europe. Throughout the curious and complex city of Berlin you can typically find between 60 and 80 separate markets. That means a whole boatload of different themes, types of stalls and entertainment opportunities. 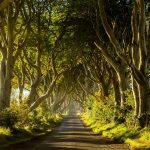 No matter the day or time, there’s bound to be something special going on in the lead up to Christmas and an endless bevy of foods and crafts to explore. 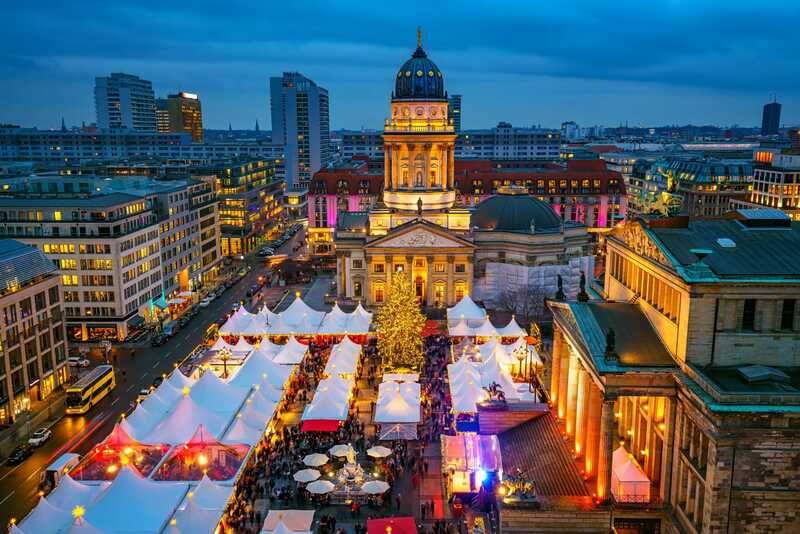 For a place to start, why not go for a traditionally-styled market with the Weihnachtszauber am Gendarmenmarkt. This classic market benefits from a great location and has daily Christmas performances that are a real hit with locals. Next up is Berlin’s earliest market, Winterwelt am Potsdamer Platz, which is the first market to open by quite a margin. Featuring a DJ, a giant luge you can ride on and a game called eisstockschießen that appears similar to curling, there’s plenty to do in this winter wonderland. One last market worth mentioning is the market behind Alexanderplatz, Berliner Weihnachtszeit, which includes an ice skating rink and Ferris wheel. Berlin’s Christmas markets aren’t just music and outdoor activities though. They’re also a minefield of delicious snacks, whether its oversized, heart-shaped gingerbread cookies or mini doughnuts known in Berlin as schmalzkuchen. Those snacks are sure to leave you with plenty of energy to power on from one market to the next. 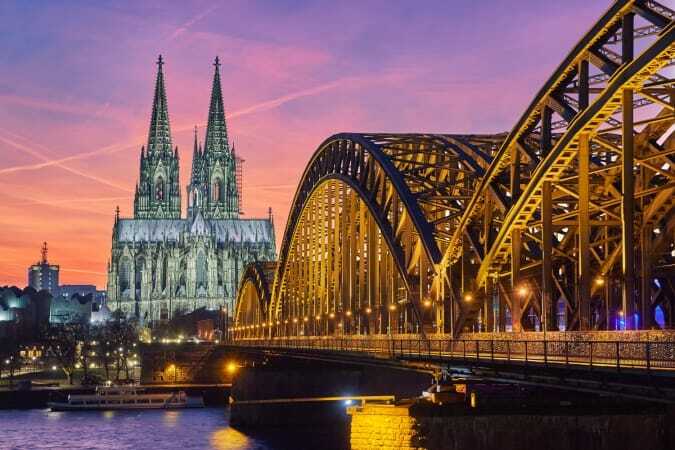 Germany’s fourth largest city and a popular tourist destination already, it’s little wonder that Cologne knows how to celebrate when Christmas comes around. 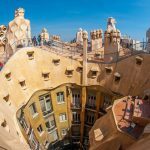 Spending the lead up to the holidays here means you can split your time between regular sightseeing and visiting the city’s markets. After all, sightseeing is always more fun when you can relax afterwards with a nice warm mug of mulled wine or hot chocolate, right? Admittedly, Cologne does lack some of the deep history regarding Christmas markets that others on this list enjoy. In fact, for decades the Cologne Christmas markets were banned due to their popularity and boisterousness before being revived in the 70s. Today, the best-known market sits right outside the city’s iconic Cologne Cathedral in Roncalliplatz and boasts around 150 different stalls. 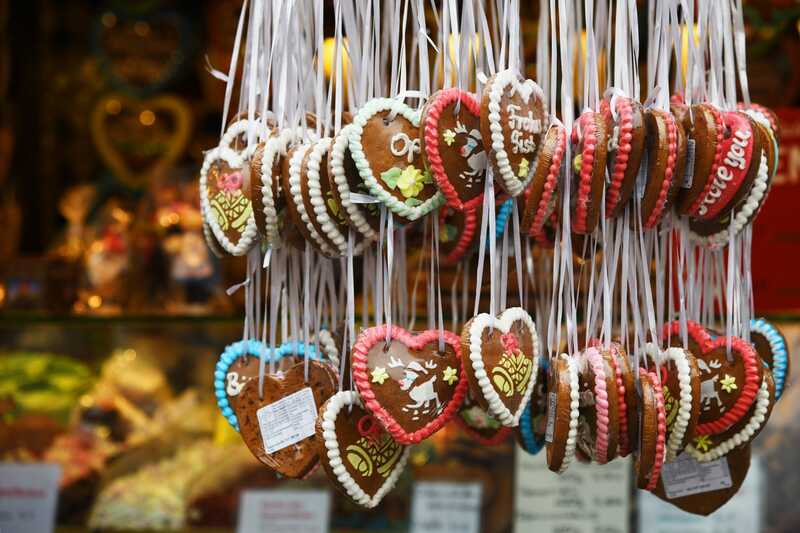 Dig into chestnuts and gingerbread as you wander about admiring the handcrafted ornaments and souvenirs. Cologne typically has a mix of large and small markets, like the ones at the Alter Markt and Neumarkt, which both pre-date the one outside Cologne Cathedral. Neumarkt is home to the Angel’s Market, where you may even meet a real-life angel as they walk through dressed in white. Other magical creatures can be found at the Alter Markt, home to the heinzelmännchen, a race of little creatures like house gnomes that were said do housework during the night for the citizens of Cologne. Unlike most markets, each alley of this market is themed like the medieval guilds of old. In countries like Germany, Christmas is a time of tradition and nowhere is this more true than the city of Munich in the heart of Bavaria. Rich with history, Munich’s love affair with Christmas markets can be traced all the way back to the 14th century. It’s thanks to the conservative nature of Germany’s south that these markets have been able to retain their traditions through the years. The most celebrated of the Munich Christmas markets is certainly the one held before the Old Town Hall on Marienplatz in the city centre. Taking pride of place in this market is the majestic Christmas tree, magically lit up with 2,500 lights. You can also be serenaded every afternoon with live music from the Town Hall balcony. For a warm and tasty snack, find yourself some reibekuchen, which are German potato fritters. 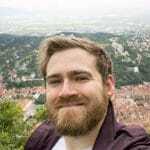 Of course, you can also explore other Bavarian cuisine specialties or go with an old standard, such as an appetizing bratwurst sausage. While it’s very common to find hot mulled wine in Germany and beyond, Munich also features unusual delights like hot beer and herb liqueur. However it’s not all completely focused on tradition in Munich, as the Pink Christmas Market on Stephansplatz will show. Created by Munich’s gay community, this small market packs a lot of character with shows featuring comedians and musicians, a touch of glamour and an all around fun and social atmosphere that welcomes everyone. This is just one of Munich’s many themed markets that celebrates different interests and walks of life. When it comes to the prettiest Christmas markets in Germany, conversation is sure to turn to Stuttgart. This major southern city really sparkles when Christmas rolls around, and its centuries-old markets are bound to delight all of your senses. The 3.6 million people that flock to Stuttgart to visit the hundreds of stalls at the Stuttgart Christmas markets every year can’t be wrong. 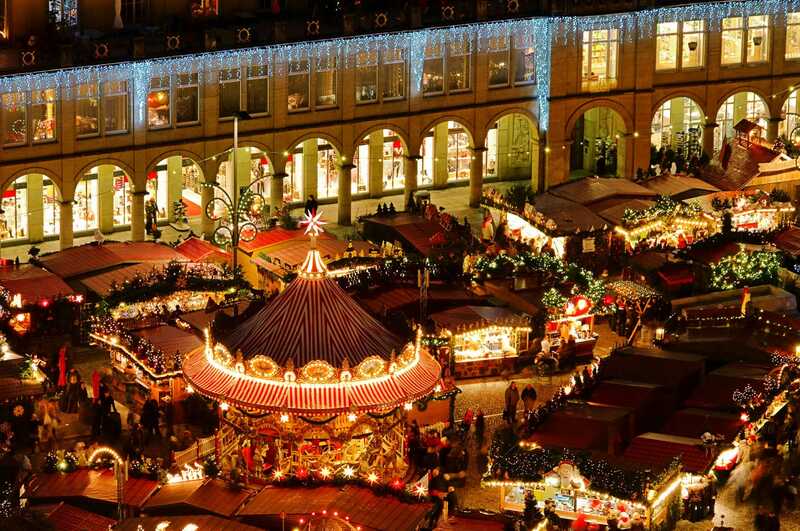 The city’s main market, the Stuttgarter Weihnachtsmarkt, is found on Marktplatz in the heart of the city. It stretches from there across to the Schlossplatz outside the city’s New Palace, although the festive season is first kicked off from the inner courtyard of the Old Castle nearby. Still, Marktplatz is the beating heart of Christmas in Stuttgart, especially since the Town Hall there becomes one giant advent calendar for the season. Although Stuttgart shares many of the hallmarks of German Christmas markets, it would be unfair not to mention the city’s Finnish Christmas Village. Celebrating festive traditions from Finland instead, here you can even find reindeer meat, smoked salmon and Finnish beer and vodka. 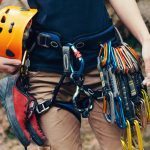 It’s sure to make a nice change of pace and show you something completely different. As for what treats and trinkets can be found across the rest of the Stuttgart market stalls, you’d be hard-pressed to come away from them empty handed. Whether it’s adorably old-school teddy bears, candied almonds, fruitcake or anise biscuits, there’s something sweet for everyone. Christmas in Leipzig kind of has it all. 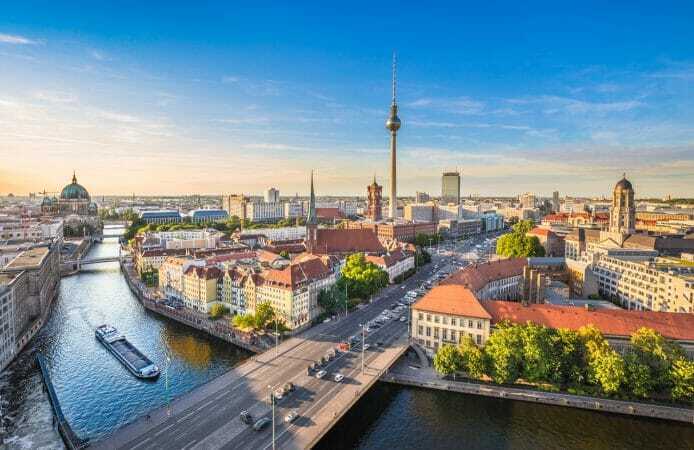 Now considered one of the country’s coolest cities, this city in eastern Germany also enjoys the festive season thanks to its stellar markets. 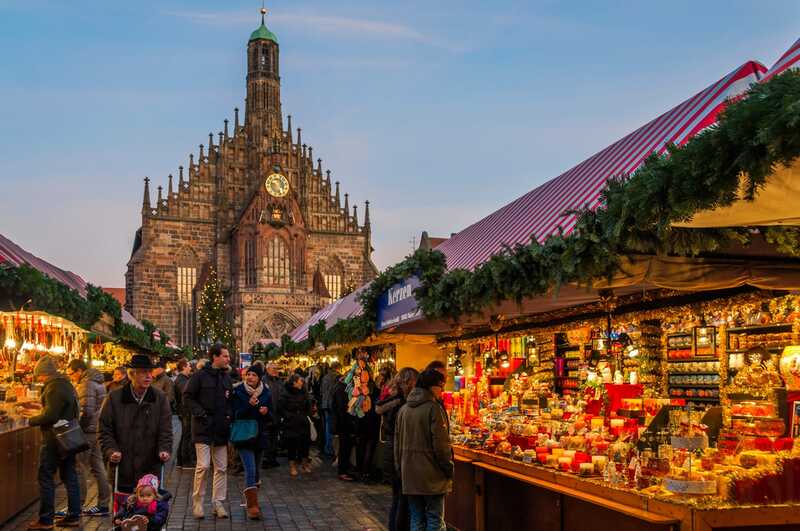 That’s hardly surprising given that its tradition of Christmas markets stretches all the way back to 1458, making it another of Germany’s oldest Christmas market destinations. The central focus for Leipzig at this time of year is the market that fills Marktplatz outside the city’s Old Town Hall. This is where you’ll find the great big Christmas tree. Sprawling from here and throughout the historic centre you’ll find as many as 250 – 300 market stalls, making it one of the largest in all of Germany. 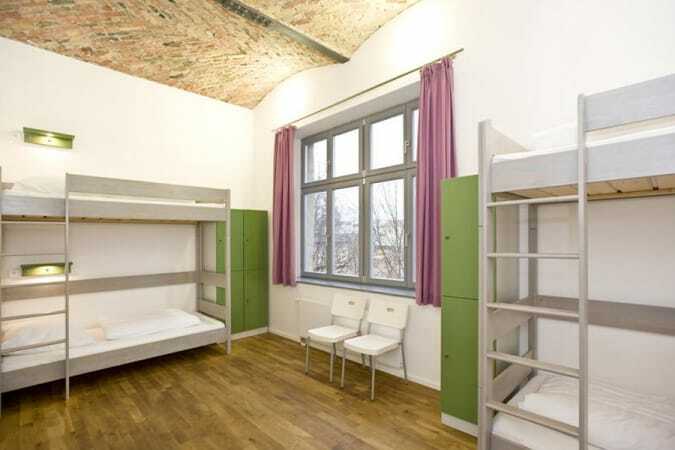 Other markets to look out for include the “Old Leipzig” at the Naschmarkt and the market in Augustusplatz. For people traveling to Germany with kids, you’ll be glad to hear that the Leipzig markets are known for their child-friendly atmosphere. 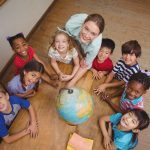 Your kids are going to love all the fun attractions that include everything from a carousel to a model railway and elves workshop. The market even features a massive Advent calendar! Don’t miss the daily performance by brass musicians from the balcony of the Old Town Hall, which should entertain young and old alike. In the markets themselves you’re going to find many of the expected goodies, from local arts and crafts to traditional Saxon German food and drink. This means glühwein, punch and “kinder punch” for children, with the coolest place to get your punch clearly being the Christmas pyramid by the Nikolaikirche. Often seen as more of a business and shopping destination, the city of Düsseldorf also happens to be a formidable Christmas destination. 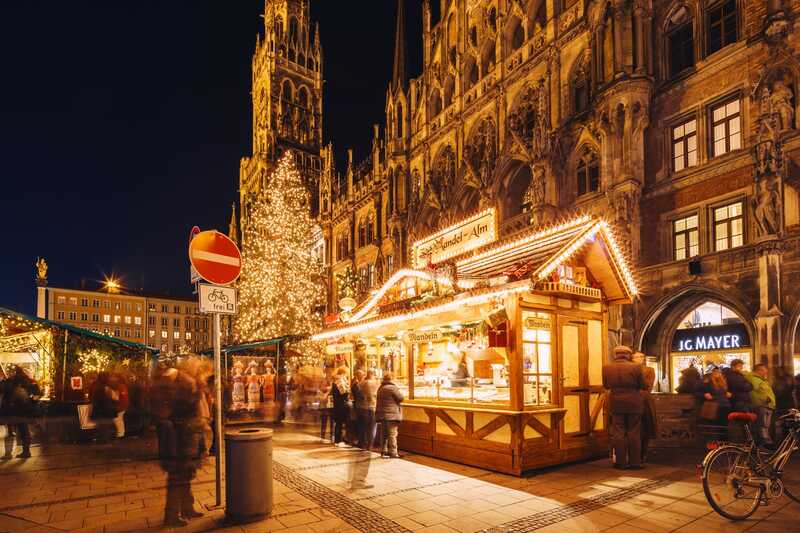 Unburdened by history and tradition, the Düsseldorf Christmas markets can get creative, with seven different themed markets spotted around the city. If you’re looking for variety in your festivities, look no further. 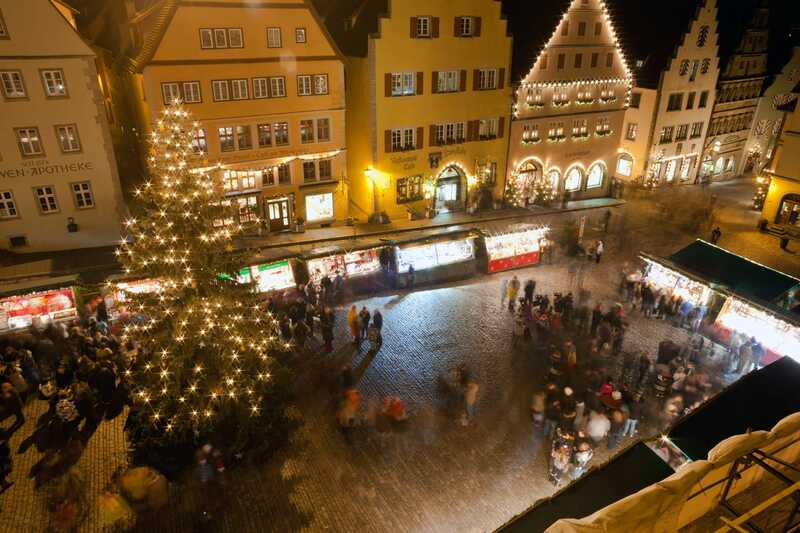 That being said, Marktplatz is the place to go if you are searching for a traditional Christmas in Germany. Surrounded by the elegant Town Hall, this Christmas market has everything from glass-blowers to a carousel and even a to-scale nativity scene. This is actually the rare market to be found within Düsseldorf’s modest Old Town. Most of Düsseldorf’s festivities are found over by the city centre and business district. 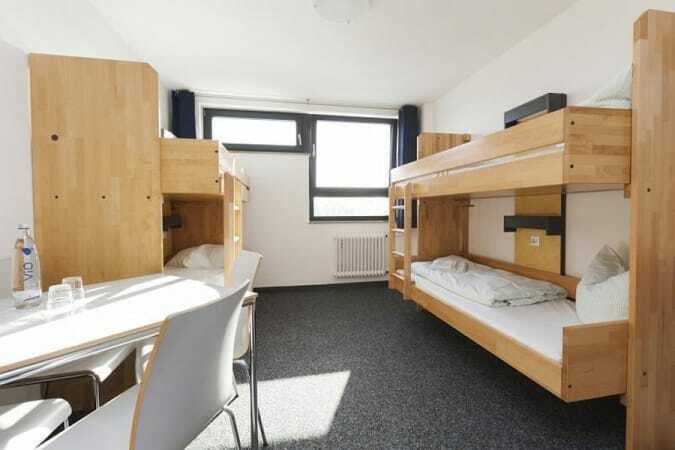 It’s in this area that you’ll find both the Little Angel Market and Little Star Market on Heinrich-Heine-Platz and Stadtbrückchen. Just nearby within the city’s ever-popular shopping district, pretty light displays run along Königsallee all the way to an ice rink that has taken over Corneliusplatz. Much like the rest of the year, Düsseldorf is a city for shoppers, so flitting between high-end boutiques and market stalls is to be expected. Stalls are often found right outside Düsseldorf’s modern shopping complexes, such as the Schadowplatz market outside Kö-Bogen. It’s a great place to refuel on glühwein and waffles. One of the greatest surprises come Christmas in Germany is the lesser-known city of Erfurt. Yes, this charming city in central Germany manages to be both a hidden gem and also home to one of the best German Christmas markets in the country. 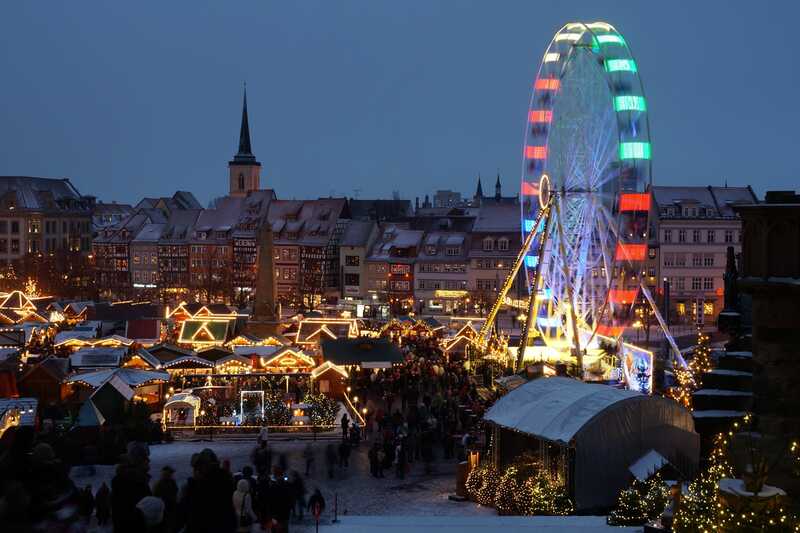 The best place to start with the Erfurt Christmas markets is in Domplatz, right in the city’s medieval centre. It’s here, by the Erfurt Cathedral and St. Severi, that you’ll find the city’s main market whose stalls are dwarfed by a mighty 25-metre-high Christmas tree. The square is also home to a staple of German Christmas markets, a Christmas pyramid, which in Erfurt features 12 meters of special, handcrafted woodwork and five special themed tiers. Once at the Christmas markets, they are a fabulous opportunity to explore local delicacies from the surrounding region of Thuringia, like the Erfurt schnittchen, a local variant of the German fruit loaf stollen. Then there’s the Thuringian bratwurst, the region’s spicy take on the beloved German sausage. On the crafts front, Erfurt is particularly known for its pottery and blue-dyed fabrics. Blending the two is the Children’s Eco-Bakery, where kids can make their own biscuits from organic dough. Since Christmas is one of the prettiest times to visit Germany, why not make a beeline for one of Germany’s prettiest towns, Rothenburg ob der Tauber. 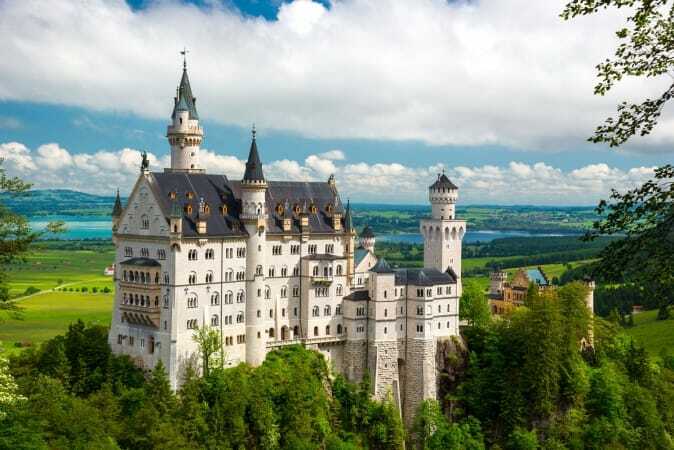 This charming town is found on the scenic Romantic Road (a tourist route linking a number of picturesque towns and castles in Germany) and makes the ideal setting for a Christmas market. Set among an enchanting medieval town, you’ll find Rothenburg’s Reiterlesmarkt. Its presence has been celebrated since the 15th century and like Rothenburg, it’s barely changed over the centuries. Admittedly small, the Reiterlesmarkt compensates by creating a winter wonderland that’s best appreciated from the Town Hall tower on Fridays and Saturdays. The Christmas market owes its name to the “Rothenburg Riders”, mythical horseback messengers whose arrival is greatly anticipated by locals. Just as it’s starting to feel like the food and drinks on offer at the German Christmas markets are all the same, along comes Rothenburg. Here, one of the distinctly local Christmas snacks is a shortcrust pastry known as a Rothenburg Snowball or schneeball. Then there’s how the locals like their hot mulled wine, aka glühwein. Although mulled wine is generally thought of as made with red wine, Rothenburg is one place where white mulled wine is a winter favorite. So, there you have it, without a doubt the best Christmas markets in Germany. From the traditional and historic to the more modern, offbeat siblings, these are the best places to celebrate the season of good cheer when visiting Germany.